Break away lanyards offer the strength of woven nylon and the safety of a unique breakaway plastic clasp that releases with a tug, reattaches with a snap. Break away neck lanyards are ideal for people who find clips, chains or pins uncomfortable or impractical and are the perfect choice for a wide range of active work environments such as schools, hospitals and corporations. All of our break away neck lanyards can be shipped with a multitude of attachments at no additional charge and can be custom printed with your own design. 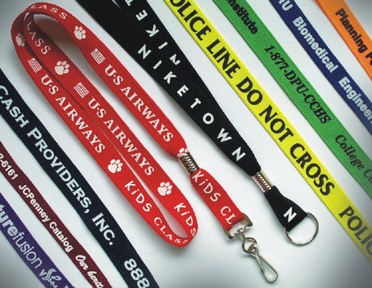 We can custom print your break away lanyards with logos, brand indentification markings, phone numbers, website addresses or any other unique message that will enhance your image. 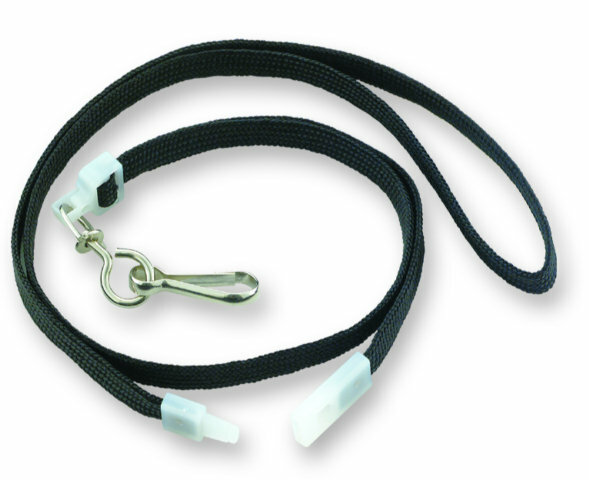 3/8" wide flat woven nylon neck lanyard. See various attachment options below. 5/8" wide flat woven nylon neck lanyard.